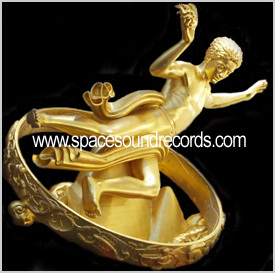 Hello Prometheus and welcome to Spacesound Records. We would like to shed some light on the individuals who make the music we all love. What better way than hearing it from the artists themselves. I was born in 1977 and live in Stockholm, Sweden. Currently I'm writing a book and doing some consulting business in the media industry. Can't really say that I've spent much time on music, but I did play an instrument for a few years in my early teens. Recently I've learned the basics of music theory, but I can't read notes yet. In the year 2005 I wanted to explore the field of audio a bit and started to experiment with various music software on the computer. From there an interest in actual music making evolved further. Nowadays I have little time for hobbies. But I like sailing, playing golf, skiing, watching movies, reading books, writing, etc. I have my pick of favorite songs from various genres. The best album I've heard so far, as an integrated work of art, is Vangelis "1492: Conquest of Paradise". Overall I tend to be interested in absorbing film music, especially movie scores with a clear melodic theme. There's something 'big' about orchestral arrangements, and the timbre of instruments such as the cello or the oboe is just so beautiful and inspiring. I also enjoy some opera, like Pucchini and Andrew Lloyd Webber. I experiment with 'film music' and other stuff that evokes certain moods and feelings. This often results in long, evolving, atmospheric and dreamy sequences where any melodies are slow and played by acoustic guitar, piano, flute or cello. Maybe one could brand this type of music as "relax and meditation music". Typical artists that inspire me in this regard include Enya, Enigma, Era, Vangelis, Mike Oldfield, Delirium, etc. One heavy component of the classic spacesynth by Laserdance & co that has always inspired me is the 'soundscape', as some would call it. I mean the warm analogue instruments themselves, and the resulting sound as a whole when they are mixed together. I'm actually more interested in re-creating that particular magic sound than I am in composing music! Melodies can be played by any instrument. But a soundscape... now that's an art form itself, I think. And it is 'sounds' that I mostly listen to in spacesynth music. Particularly leads, stabs and snare drums. A good lead sound can almost feel like a real person to me. And I'm such a sucker for heavy stabs. Perhaps one could say that I'm drawn to "sound sculpture", and that the 'classic spacesynth sound' is for me in audio what statues such as Venus de Milo or Michelangelo's Pietà is for me in marble. Yes, it's too small! I'd like to see at least 10 times more composers of spacesynth around. Sometimes I wonder how many dedicated consumers of spacesynth in total there might be on the planet (or off-planet for that matter...). I still haven't heard much of the classic spacesynth stuff, mostly only Laserdance and some Koto songs. But overall I'd say that the works by Michiel van der Kuy and Gustaf Grefberg have probably contributed most to my subconscious mind. I was a bit inspired by some other contemporary spacesynth artists -- in particular Protonic Storm and Galaxion -- so they'll have some credit too. Recently I've also been very inspired by Galaxy Hunter's songs, especially those that are crowned with the divine voice of Monika Novak. Something is often a favorite in just a limited context. Gustaf Grefberg is my favorite in regard to melodies, a real "MelodyKing". Protonic Storm is my favorite in regard to 'modern' soundscapes. He makes the music, especially the leads, seem almost alive in a progressive way. But good old Laserdance is the King of the castle in regard to both sound inspiration and melodies. Why else would I buy a Roland Juno 106 synth just for emulating another producer's bass-sound? So my overall favorite artist/group has to be Laserdance. "Future Generation", because it contains so much of value for me. Great melodies, great sound. The kind of magic sparkle and dynamics that many tracks lack in today's world of multiband compression. Sure! Don't hesitate to drop me a line in a PM over at spacesynth.net if you're interested in producing a track together with me. I find value in working together with most people, regardless of their experience and skills. Oh yes. I haven't heard many songs in this genre, but out of those I've heard so far my favorite song is "Faces" by Clio. Listen to it on YouTube at http://www.youtube.com/watch?v=oM0hFvB2Fms ... Now THAT kind of Italo disco is even better than the best in spacesynth in my opinion. I was quite inspired by that scene back in the early 90's. I had some contact with Swedish demogroups such as Triton and Cascada, but I can't say that I was very active on the scene myself. At least not as a musician. My interest back then was in graphics and coding. I remember when I managed to code my first starwars scroller and gaurand shaded vector cube, using the popular combination of Borland's Turbo Assembler and Turbo Pascal 7.0... ahhh, those were the times. And I still think that the music by many demoscene musicians, such as Jonne Valtonen (Purple Motion) and Gustaf Grefberg (Lizardking), rocks. There is this old Amiga module called "Space Debris" that I absolutely adore. Anyone who hasn't heard it needs to check it out. In fact, I do see an advantage of coming from the demoscene in regard to spacesynth composition. The demoscene was like a huge laboratory of freedom and creativity. If you grow up in that atmosphere, you got certain standards by default that may have helped to stimulate experimentation in a wider context. The popular spreadsheet-like tracker software were sent from the Gods in that you'd become a coder of sound and build the music in a bottom-up approach with control of every single parameter (somewhat similar to assembler coding). Trackers are perfect tools for spacesynth composition. Most of the time I split my keyboard into two parts, the zone that is played by the left hand is configured to host a nice pad sound and an arpeggiated bass. The zone that is played by the right hand is configured to host a lead sound with a filtered delay effect. Then I'll just start jamming. My left hand is pressing single keys, the root key of what's later to become chords. With my right hand I pick out the melodies. When I have recorded the melodies, I try to find which chords fit best to them. Then I drop some drums and basses on the tracks and we're in the game. Melodies are very important in spacesynth, but actually I think the soundscape is more important. You can create a nice melody for a spacesynth song and play it on a Spanish guitar, people would probably still like it. But there's no substitute for that characteristic and integrated spacesynth-ish sound: saw stabs, repeating basslines, the percussion, synth leads, etc. The sound together with good melodies is what creates the magic. For me, a perfect spacesynth song will deliver both. Hard to say. I like pushing boundaries, but not as an end in itself. The sound of the Golden era is quite valuable to me, so I guess my spaceship sails more around in the "classic" galaxy in the sense that I'm trying to understand how to re-create that sound. But I really don't want to fit myself in any particular camp, I'd prefer to develop my music out of an open and broad palette, in my own style. The fact that I'm fascinated with the classic sound doesn't mean that I'll necessarily publish songs in that style. I'm not a copycat, nor do I think it's an end in itself to settle for nothing but pure originality and novelty. That's not my game, I just want to make some music that I can enjoy on the beach while reading magazines and eating peaches in the sun. I strongly believe that melody focused spacesynth will only appeal to minds that subconsciously operate on the principle of integration. The space theme is just the esthetic symbol for all that makes technological achievement, grandiosity, curiosity and willingness to explore reality possible. You simply can't have mass appeal with any mass that is allergic to integration in their implicit philosophies and seek to avoid it in art. Currently I just use a laptop computer running Renoise with mostly free VST instruments. But I do own a hardware synth, a Juno 106. Guess I'm quite minimalistic, although I wouldn't mind having a 'real' studio with lots of hardware gear some day. I prefer software synths for composition because they are so flexible and portable. However, I think many hardware synths have a certain audio quality character that I haven't really experienced (yet) with any software emulation. For example, the Juno 106 bass... it just sounds so warm. No matter how much I tweak sounds on the computer, I just can't reproduce the same character. So I guess that for production, at the stage of actually mixing down the music, I would prefer to route all channels via hardware synths if I could. Try composing your own music! It's easy and you can contact me in private at spacesynth.net for (free) starter lessons. I'll provide everything you need for your computer -- on any platform (whether MacOS, Windows, Linux). 2. Market or Shopping Mall? Mall. 11. Sweet or savoury? Sweet. Once again thank you for allowing us your time in answering these questions, it is very much appreciated! We hope this gives the spacesynth community a little better insight into yourself as an artist.